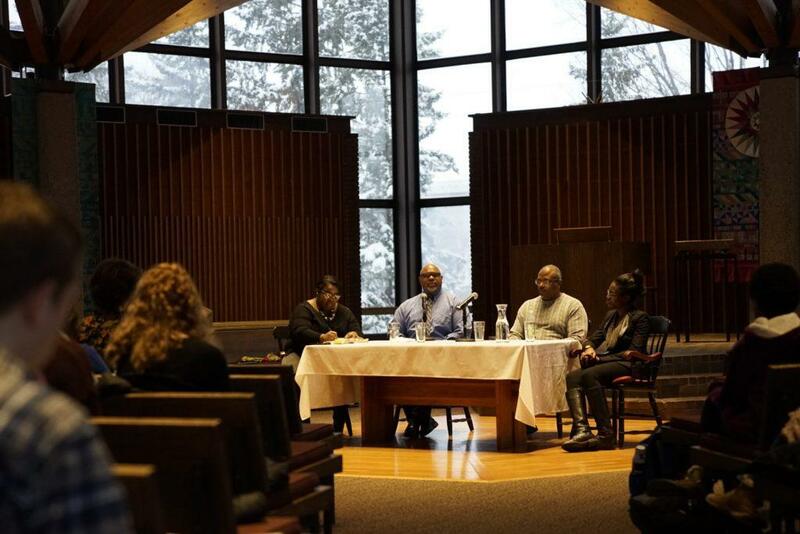 Dr. Dennis Edwards, religious studies professor Bill Hart, and Vivian Ihekoronye ’13 discuss the life and legacy of MLK in the CRSL on Tuesday. The panel was moderated by history professor Crystal Moten. Photo by Ally Kruper ’21. 50 years ago last Wednesday, Rev. Dr. Martin Luther King Jr. was shot dead while standing on the balcony of the Lorraine Motel in Memphis, Tennessee. He was 39 years old. On Tuesday April 3, Macalester’s departments of political science and religious studies, along with the legal studies program and the Center for Religious and Spiritual Life, hosted a panel to commemorate that speech and King’s life, while reflecting on his legacy and vision. 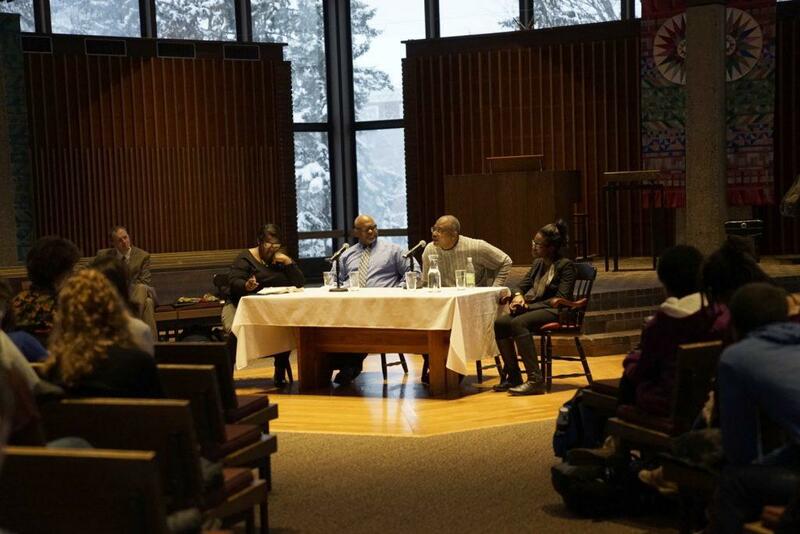 The panel, moderated by history professor Crystal Moten, included Dr. Dennis Edwards, the senior pastor at The Sanctuary church in Minneapolis, religious studies professor Bill Hart, and Vivian Ihekoronye ’13 – now a community organizer for the faith-based St. Paul political action group ISAIAH. The evening was largely about venerating King the man, while decrying the construction and exploitation of his mythos by a country that has loved him far more dead than it ever did alive. Religious studies professor Bill Hart speaks at the panel on the Rev. Dr. Martin Luther King Jr.’s legacy. Photo by Ally Kuper ’21. King, certainly, was not anodyne. He called the United States the “greatest purveyor of violence in the world” during the Vietnam War, and supported a universal basic income and guaranteed employment. For Ihekoronye, the oldest of six children born to Nigerian immigrant parents in St. Paul, the experience of poverty – which King spent the last years of his life trying to eradicate – was nearly overwhelming. “Growing up, I experienced deep poverty,” Ihekoronye said. 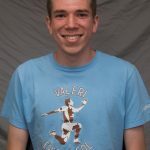 “My dad was working 16-hour shifts, and every day, the experience and violence of poverty was something that I had to grapple with. It was kind of like a cage. “I came to the conclusion that, with the experience of poverty and the experience of racism, I felt like the only options I had in this life were to be saved by white people or to serve them,” she continued. The fight for that reality is, clearly, ongoing. The irony is that King has increasingly been deployed by the very forces that are trying to prevent his vision for America from coming to fruition. Pence, of course, walked out of an Indianapolis Colts game last fall after several players kneeled for the national anthem in protest of police violence against black Americans. Hart is right. 61 percent of Americans opposed the Freedom Rides in 1961, and 60 percent opposed the March on Washington in 1963. In 1966, two years before King was murdered, 64 percent of Americans viewed him unfavorably. Now, just four percent do. That dramatic change in King’s approval rating has come with a price. The reductionism practiced in the crafting King’s current image has extended, in many ways, to the legacy of the entire Civil Rights Movement. Moten and Ihekoronye both spoke about the role of women in the civil rights struggle, while Hart touched on the width and breadth of the movement that King helped lead. “History is complicated, and Americans hate history,” Hart said. “We like to tell these simple-minded stories… There’s no doubt that in the black freedom movement, King was the tallest tree. But he was just a tree. The black freedom movement was a forest. In his latter years especially, working in the urban north, King grappled with the validity of violence – defending urban riots – and turned increasingly towards international affairs. Ihekoronye, in her remarks, spoke about taking heart in King’s own internal conflicts. King, much in that way, was able to keep faith in the promise of his country and his countrymen. Strange as it might seem, in King’s mind, those sentiments were not antithetical. Just wanna input that you have a very nice web site , I love the pattern it really stands out.